WE WON! 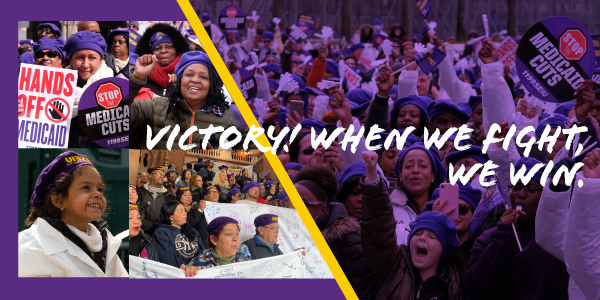 The proposed $550 million in Medicaid cuts ($1.1 billion with federal matching funds) have been restored to the state budget, and there is no doubt in our minds that taking to the streets and raising our voices made all the difference. When the proposed cuts were first announced in mid-February, 1199ers sprang into action, organizing rallies in the Bronx, Manhattan, Brooklyn, and Long Island, because we wanted to show our refusal to let these cuts go through. Thousands of us called and emailed our state legislators and told them to vote NO on ANY cuts to healthcare. After rallying in our own front yards, we boarded over 150 buses, vans, and cars and made our way to the state capitol, to carry our message directly to our elected leaders tasked with balancing New York State’s finances. We rallied, we marched, and ALBANY HEARD US. • A full restoration of $550 million of the devastating cuts that were proposed to healthcare in Governor Cuomo’s 30-day budget amendments. The restorations include the full Healthcare Transformation Fund, which we fought so hard to win last year and which helps to fund the contracts signed by downstate hospitals and nursing homes last summer and fall. Medicaid spending will rise a full 3.6%, as originally proposed. The budget also protects against the Trump Administration’s assault on healthcare by ensuring that all the provisions of the Affordable Care Act are included in New York law. • An agreement from the Legislature to significantly reform the way that the consumer-directed home care program is organized. This program, which was started by disability rights advocates to have more control over needed services, has been flooded by unscrupulous companies who have been making huge profits and undermining labor standards. Now all consumer-directed providers will have to have a contract with the state, which we expect will lead to many fewer of them and the potential to organize tens of thousands of those workers. • Full coverage of the Traumatic Brain Injury waiver program under the wage parity law, giving many 1199 members a raise and ensuring that they will be paid the same as others doing the same work. • More tools for the Office of the Medicaid Inspector General to hold providers accountable for paying wage parity benefits by ensuring that Medicaid dollars can be traced from the state to managed care plans to providers. • A $15 million investment in the Enhanced In-Home Services for the Elderly program, which provides home care services to those who are just above the income cut-off for Medicaid. • 2% cost-of-living increases for direct-care workers under the Office of People with Developmental Disabilities, the Office of Mental Health, and the Office of Alcohol and Substance Abuse Services, to be implemented on January 1, 2020, and April 1, 2020. • An increase of $32 million (from $50 million to $82 million) in the Enhanced Safety Net pool, which covers public hospitals and those with a majority of Medicaid or uninsured patients. • A new loan program for financially distressed hospitals to help with cash flow issues. • An additional $3.8 million in funding for School-Based Health Centers. • A requirement that Department of Health conduct a study of how staffing enhancements could be used to improve patient safety and the quality of healthcare delivery in hospitals and nursing homes, including through minimum staffing levels for registered nurses, licensed practical nurses and certified nurse aides. The study will also look at the cost of those enhancements, and must be completed by December 31 of this year, with input from stakeholders, including direct healthcare workers and labor unions. The final budget agreement also allows for $300 million of this year’s capital allocation to be awarded to projects which were not funded in the last round. This gives another chance to some of our institutions to receive the funding without having to reapply in a new process. Finally, although the governor proposed a new pharmacy technician certification process and grandfathering of existing workers, this did not make it into the enacted budget. We will continue to work on this issue, especially given recent enforcement actions by the State Education Department which are limiting the work that pharmacy techs can do in hospitals. This is a solid budget that reinstates the funding to help cover our League and other contracts, and that increases care for some of the state’s most vulnerable. It helps ensure that our safety net hospitals have the operating funding needed to keep their doors open, helps protect jobs for our dedicated, hardworking members, and gives us more opportunities to hold employers accountable and to grow our union. This is a WIN for 1199. Thank you for your continued faith in the work we do to support the work you all do each and every day. We are stronger together, and when we stand together to fight, WE WIN!